Our unique range of scanners and scan protocols means that we can optimise exposures for every eventuality for simple site evaluation or complex guided procedures. Dental Implant Surgeons can place implants with the optimum accuracy using the 3D images produced by the CBCT scanner and measure bone depth and width; as well as accurately define the location of anatomical structures. Our CBCT images will also be the starting point of any guided surgery approach, from a simple lab-made stent to digital guided surgery. We also support our referrers with embracing the digital flow whereby dental restoration is prosthetic-led. We have led the way in 3D imaging in Endodontics and provide scanning services for the key opinion leaders in Endodontics. Once using CBCT technology, many of our referring endodontists recognise that conventional x-ray scans hide areas. We follow the latest ESE guidelines and when a scan is justified, we recommend small volume, high resolution 360° scanning to minimise artefact. You will be able to examine your patient’s dental root canals in 3D which allows you to reach an accurate diagnosis in preserving natural teeth. Failing root canals can also be examined closely to understand the cause. Additional untreated canals are often found in the molars that would not have been noticed at the time of the initial root treatment. Case showing baby tooth growing inside adult tooth. Slice scan of baby tooth inside adult tooth. CBCT permits precision evaluation of the complex bony topography found in the periodontal patient, allowing tissue thickness to be measured prior to grafting. Cone Beams allows practitioners to have a clear view of facial nerves and bone structure, which allows you to plan a specific procedure to protect the patient’s nerve endings. This advanced technology allows practitioners to minimize pain and increase healing time. Two dimensional periapical and panoramic radiographs are routinely used for diagnosing periodontal bone levels. In these two-dimensional images, the evaluation of bone craters, lamina dura and periodontal bone level is limited by projection geometry and superposition of adjacent anatomical structures. These limitations are eliminated by the three-dimensionality of CBCT imaging. The axial, coronal and sagittal multi-planar reconstructed images are without magnification. Pseudo-panoramic images are reconstructed without distortion and magnification. This is obviously beneficial to the diagnosis of intra bony defects, furcation involvements and buccal/lingual bone destructions. We do not recommend large volume CBCT scanning for young orthodontic patients unless there are significant indications, such as complex surgical planning. Small volume reduced dose techniques however are extremely useful for assessing impacted teeth. Anatomical models allow for meticulous planning of surgery. The versatility of the state-of-the-art CBCT allows radiation to be very optimised. This is important for all patients. It is paramount for children. 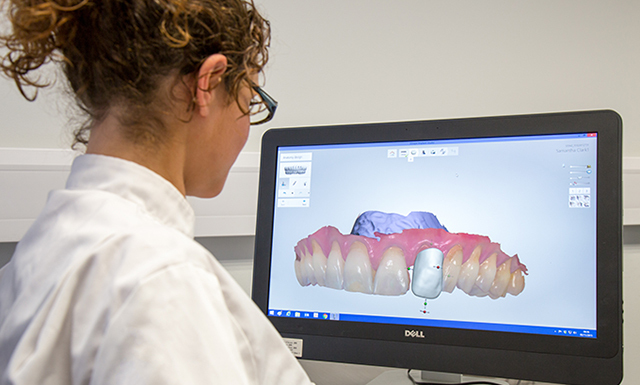 We offer radiation-free 3D surface scanning and Cephalometric imaging and tracing for our Specialist Orthodontic users.